Same model as Vivace 40 Deluxe in a different finishing. It has 2x61 Note Keyboards with Tracker Touch system. 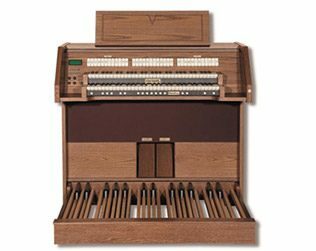 The organ is equipped with 31 beautyfull voices and all the relative controls are easily accessible via the LCD alphanumeric display. The VIVACE 40 has a modern and compact design which fits perfectly in almost any environment. The instrument is equipped with 2 "Tracker Action" style keyboards and a set of pedals. It features over 31 registers, a library of 110 unique voices, and 5 different styles, all selectable through the handy graphic display. You have a wide selection of magnificent organ and orchestral voices with which to create countless combinations; these can then be stored in the 48 internal memories – and easily recalled as you need them. 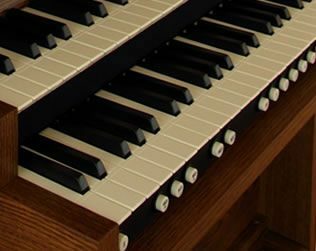 The VIVACE 40 uses proprietary sound technology specifically designed by Viscount in Italy to faithfully reproduce the authentic sound and performance of the traditional organ – including the acoustic effects and reflection characteristics of a small church all the way up to a large cathedral. A perfect instrument for students, the VIVACE 40 is simple to use while offering optimal construction quality and richness of sound. cm 124 x 110 x 96 - 48.81" x 43,30" x 37.79"
cm 124 x 110 x 63 - 48.81" x 43,30" x 24.80"
Buttons, knobs and a graphic display give you complete control of the instrument. The register on/off buttons, knobs and all other controls are ergonomically arranged to respond quickly and accurately to the demands of the player. A side-located graphic display has an understated presence that is well integrated with the instrument – providing unlimited possibilities for customization and control. A "Tracker Action'' style keyboard with exceptional tactile response. Knowing the importance of the classic-organ keyboard, we’ve taken the utmost care in selecting the absolute best components. The mechanics of the keys gives the impression of a true “Tracker Action”, by obtaining the speed of actuation of the keys – making it possible to feel the “Tracker Touch” effect. i.e. the correlation between the “touch” of the organist and the transient attack of each virtual pipe. 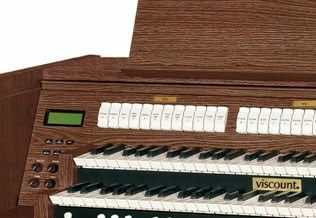 The result is a comfortable and consistent feeling sure to satisfy the organ purist. The entire VIVACE line uses proprietary sound technology specifically designed by Viscount in Italy to faithfully reproduce the authentic sound and performance of the traditional organ – including the acoustic effects and reflection characteristics of a small church all the way up to a large cathedral. 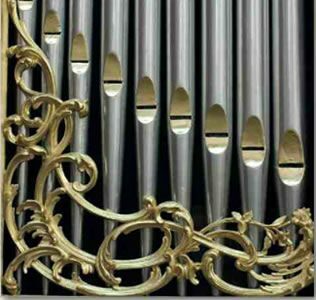 These organs faithfully reproduce the sound and expression of a traditional pipe organ.These organs have been selected for use in some of the most prestigious and demanding installations with special pipes prepared for this purpose.